To the Editor of the Gleaner. Sir, The Editor of the Budget, in his issue of this morning, says he is the oldest newspaper writer in the island. Surely, his memory is at fault. He succeeded me in the office of the Daily Advertiser in 1851 or 1852. This was his first connexion with any paper. A few years after he obtained employment in the office of the Morning Journal, as my assistant, superseding me entirely after a few months, when I went to the United States. My first essay at newspaper writing as a regular in door attache, was with the Creole Miscellany in October, l849. This was followed by the Public Advertiser in the following year, as a regular newspaper. Since then, with the exception of nine months' illness in New York, I have been attached to the Press, my spheres of labour having been in this city, New York, New Orleans, Key West, Rio de Janeiro, and again in this city - to say nothing of my long cruises as a war correspondent up and down the waters of Virginia and Maryland, and my similar labours on the Missisippi. This is written in no spirit of hostility to my old colleague, for whom I entertain much esteem; but in order to set him right in a matter wherein he has made a mistake, I am certain, from sheer forgetfulness. With the death of Mr John Costello of the "Falmouth Post" the present writer became the oldest literary member of the Jamaica Press, dating, as I have said already, from 1849, as an amateur from 1846. The Editor of the "Budget" - no disparagement to him - must have been then at school. Sir, - An old friend and printer of very long standing writes to correct me. He says truly, as I now recollect, on my memory being refreshed, that though I am quire correct in claiming to be the oldest living member of the Jamaica Press, I am mistaken in saying that the Editor of the Budget commenced his newspaper career on the Advertiser - a respectable sheet. He matriculated in the office of The Banner of the People, a licentious and scurrilous paper that, like the ephemera, passed away ere it had well commenced its brief existence. 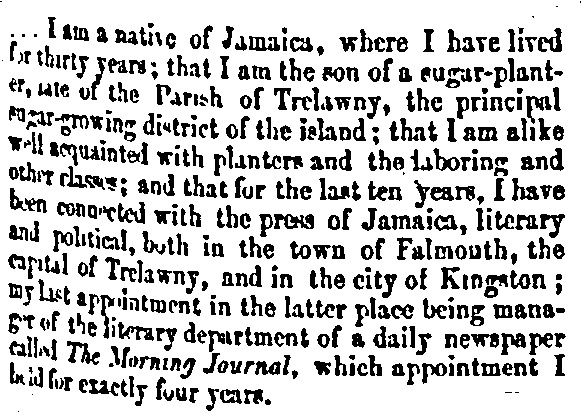 At that time I had already been connected for several years with the Press of this island, in Falmouth and in this city; and I was, even then, or about that time, the accredited correspondent of the New York Herald. My press connexions have been respectable from the very first. As I like fair play the Editor of the Budget is welcome to the foregoing emendation. AMONG the passengers by the Rifleman yesterday, is, Mr. S. B. Slack formerly the editor of the Morning Journal, who has been residing in America for some time, and was the travelling correspondent of the "New York Herald." We understand that Mr. Slack has severed his connection with that paper, and has returned home for good. First - That I was formerly Editor of the Morning Journal. Secondly - That I have been residing in America for some time. Thirdly - That I was the travelling correspondent of the New York Herald. Fourthly - That I have severed my connexion with that paper - the Herald, I presume. Answer: I have been connected with the Morning Journal, though I never wrote myself Editor of that paper. Secondly - I have been travelling correspondent of the New York Herald. Thirdly - I have not severed my connection with that paper. Whoever doubts these propositions will please communicate with J. G. Bennet, Esquire, corner of Broadway and Ann Streets, New York, or, if time is an object to the undersigned. P.S. - I am sending a copy of the above to Mr. Bennet. S. B. S.
NOTE: James Gordon Bennett snr founded the N Y Herald in 1835; he passed control to his son, James Gordon Bennett, jnr, in 1866. In the mid-19th century the Herald was the most popular and profitable daily newspaper in the U S A; by 1861, it had a circulation of 84,000 copies and described itself as "the most largely circulated journal in the world." In accordance with previous announcement, Mr. S. B. 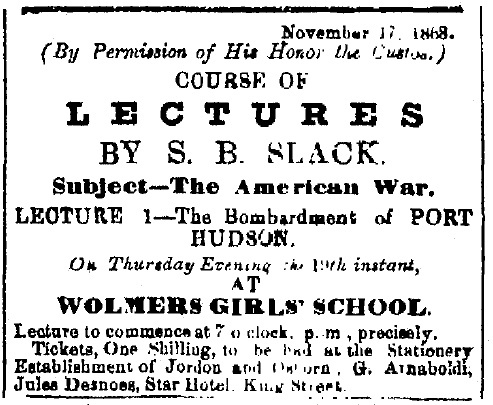 Slack delivered a Iecture - the first of a series - at Wolmer's School Room on Thursday evening, on the American War, a subject that is, or should be of general interest. All our knowledge of its stirring events, so far, is confined to such as could be gained from the hasty perusal of the newspaper accounts given at the time, too frequently inaccurate, overdrawn and exaggerated, contradictory and unreliable. So far as we know, no history has yet been given to the world of the great struggle, although it furnishes materials for a history as great and soul-stirring as that of the Roman Republic; at all events, no authentic history, if one has been written, has, as yet, reached Jamaica; it is therefore, utterly invaluable to have events and circumstances that we all feel to be of the first importance among those that are passing during our own lifetime but of which we know so little, presented to us in so acceptable a shape. It is history, not for us to read, but history spoken to us, and spoken to us, too, by one who has been an eye-witness of many of the scenes which he depicts. Mr. Slack served some time in the war, nominally an officer in the United States service, but ostensibly in the service of The New York Herald, one of [whose?] extensive and able staff of [ war?] correspondents he was. His [ ] official character enabled him to obtain the most reliable information in all [ ] related to the official direction of those departments of the conflict at which he was present, and his own keen and masterly power of observation rendered him a fit recorder of what he saw and heard, and therefore he is fitted for the pleasant task he has undertaken of affording information to those who may desire it. The first Lecture was confined to a description of the battle of Port Hudson, [ ] which, it will be remembered there was a combined attack on the batteries by the land forces under General Banks, and the Mississippi squadron under the command of Admiral Farragut. Mr. Slack was on board the Richmond, one of the corvettes of the squadron, and his Lecture shows that he made good use of his ears and eyes for he describes everything with a minuteness truly surprising when we consider the danger and excitement of the moments during which his observations were made. The Lecture was instructive and amusing, in some passages rising high above mediocrity, especially the description of the fleet running the gauntlet of the batteries; the scene presented of the flight of shot and shell when the ships opened fire; and the burning of the ill-fated ship "Mississippi". We are glad to hear that Mr. Slack intends to carry out his idea of extending the Lecture into a series, for they will afford much useful and valuable information. I have found no references to, or accounts of, any further lectures by Mr. Slack. Who, then, was Shackleton Balm Slack? Until more information comes to hand, it seems reasonable to think it possible that S B Slack was the son of the overseer of York estate, on the border of Trelawny and St James. Kingston, was established in 1852 and lasted about a year under the joint editorship of Mr C. L. Campbell and Shackleton B. Slack, afterwards on the staff of the New York "Herald." The "Creole Miscellany," proprietors and editors, Edward Mockler and Shackleton Balm Slack, weekly, from about 1852 to 1855. MASONIC LODGES UNDER THE GRAND LODGE OF ENGLAND. Meets 2nd Monday in each month. The election of Master, Tyler, and Treasurer, takes place in November. Campbell, C. L. -- "Budget"
Figueroa, F. A. -- "Standard"
Gall, J. -- "News Letter"
McNabb, J. R. -- "Government Reporter"
Morrison, W., M.A. -- "Standard"
Nutall, Enos -- "Church Chronicle"
Slack, Shackelton Balm -- "Gleaner"
Thomson, S. Powell -- "Gleaner"
Just recently I found the sad information about S. B. Slack's final days; he died as a pauper in the Union Poor House in 1886, and the cause of death is given as 'Cachexed' and 'Exhaustion', indicating a 'wasting syndrome' or cachexia, caused presumably by some major condition, such as a cancer. His age, given as 65, in 1886, seems to confirm his birth in 1821. This marriage record raises the possibility that S B Slack had a son, born probably in 1852; I have found no other references, however, to Patrick William Slack, engineer.